Despite all the health foods that I am surrounding myself with, I cannot deny that I have a sweet tooth. That's no secret, just look at my list of desserts in my recipe index. We always have a cake of sorts in the house. I am very strict by not using refined flours or sugars in my recipes. 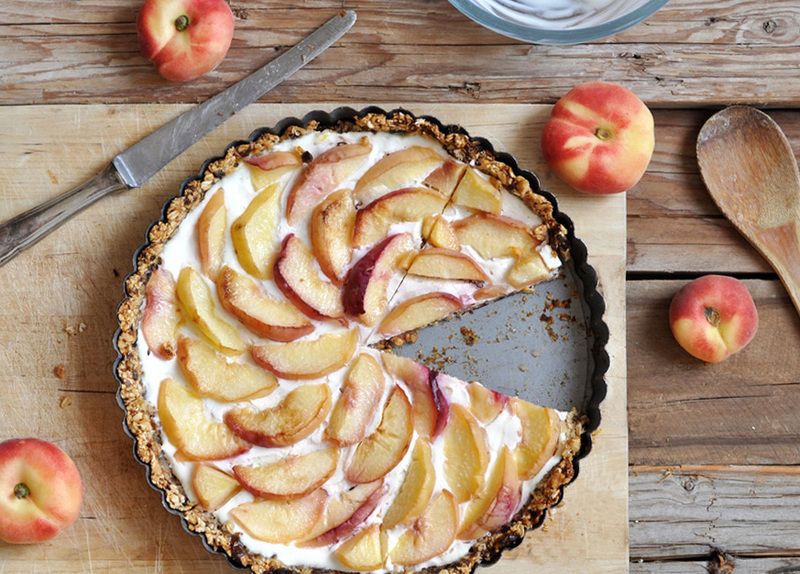 This peach cake is naturally sweetened with dates in the crust and a hint of honey in the filling. It uses rolled oats instead of flour in the crust. Natural unsaturated fats of the nuts replace butter that is usually used in tart crusts. The yogurt peach filling gives a light freshness to the cake. A perfect summer cake. Combine oats, dates, and walnuts in a food processor and pulse a few times until sticky. If the texture is too dry, add a tablespoon of water. Then pulse again. Lightly grease a tart pan with removable bottom with olive oil. Press the oat mixture into the bottom and sides of the pan. Pre-bake crust for 10 minutes. Set aside. Strain the yogurt through a cheesecloth or clean kitchen towel for two hours. Discard the whey. Mix the strained yogurt with the honey. Spread the yogurt honey mixture evenly over the crust. Lay out the peach wedges onto the yogurt, starting in the middle with a small circle of wedges. Bake at 175C/375F for 25-30 minutes. Let cool completely before serving.